Every year, YES serves more than 1,600 youth every year.YES engages youth through a unique three-tiered ladder of programs which support and challenge them throughout elementary, middle, and high school. As they move through the progressively challenging tiers, youth develop confidence and gain valuable life skills. They learn how to stay active, set goals, be confident, make healthy choices, act as community leaders, and succeed in college. 600+ youth experience rock climbing, surfing, mountain biking,kayaking, track and field and more. 800+ youth youth ski and snowboard with YES. 95% of Track & Field youth felt healthier after the program. 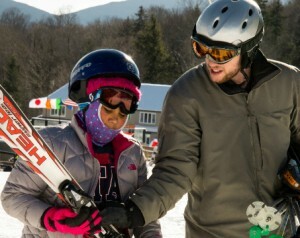 95% of Operation SnowSports youth report increased confidence after trying new activities in the outdoors. 100% of Outdoor Adventure youth increased their confidence in trying new things. 95% of Girls Outdoor Adventure Leaders report an increase in self-confidence. 80% of the Career Exploration teens increased their self-confidence. 3 out of 4 GOAL girls reported an improved body image. 100% of YES Academy teens graduated high school and enrolled in college for the past five years. 100% of teens report gaining new workplace skills and grow as leaders in the Career Exploration Program. 87% of Junior Volunteers improved their leadership skills through their volunteer experience. 75% of College Preparation youth increased their academic engagement. 100% of teens in the YES Academy have graduated high school and are enrolled in college. 100% of Career Exploration teens have professional resumes. 100% of young people in Career Exploration completed the program with a job, internship, or summer academic plans.